1. Slip the growth completely off the arm without the infusion and onto the tubing connected to the arm with the infusion. 2. Holding the container above the client’s arm, slide the sleeve up over the container to remove the used gown. 3. Place the clean gown sleeve for the arm with the infusion over the container as if it were an extension of the client’s arm, from the inside of the gown to the sleeve cuff. 4. Rehang the container. Slide the gown carefully over the tubing toward the client’s hand. 5. Guide the client’s arm and tubing into the sleeve, taking care not to pull on the tubing. 6. Assist the client to put the other arm into the second sleeve of the gown, and fasten as usual. 7. Count the rate of flow of the infusion to make sure it is correct before leaving the bedside. 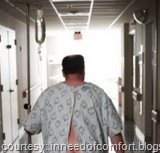 This entry was posted in Manual and tagged how to change a hospital gown. Bookmark the permalink. I’m guessing this does not apply for infusion pumps?